For those of you curious as to how my thermometer lady is dressing these days now that the outdoor temperatures were a little higher over the weekend, I thought I'd give you an update. Because I just know you can't sleep without this very important fashion advice! The funny thing is that she's not wearing that much less at 70 degrees than what she was wearing at 55 degrees. Emma's response? "Mom! You're not wearing the right outfit!" No, I wasn't. In fact, I was sitting under a blanket at the time, fully dressed and wearing a sweater. So, the next time it's 70 degrees outside, you better be wearing something similar or I'll send over the hootchie police! where did you get this thermometer? I just love it! Who makes it? Well, since I gave birth 10 days ago, I do believe a belly shirt is in order. 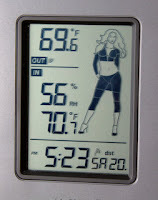 LOL> Guess what my thermometer man is wearing? The suspense is killing me. Would you do me a favor and put a match to the probe and let me know exactly how much comoes off? LOL I put it on my birthday list when you mentioned it a few weeks ago. i'll admit... since the weather warmed up here in san diego a week or so ago, i DID think about thermometer lady and i wondered what she was wearing nowadays. Patience, Mike, and you will be rewarded. You can't rush these things. She'll strip for you in good time. You should name her. Something that basically says hoochie. Now about wearing what she's wearing...I believe my wardrobe needs some steletos. Maybe I should call her Daisy Dukes, my long lost misspelled cousin? For those of you interested in getting this thermometer, I added a link in the post.